(Nanowerk News) The efficient conversion of light into electricity plays a crucial role in many technologies, ranging from cameras to solar cells. It also forms an essential step in data communication applications, since it allows for information carried by light to be converted into electrical information that can be processed in electrical circuits. Graphene is an excellent material for ultrafast conversion of light to electrical signals, but so far it was not known how fast graphene responds to ultrashort flashes of light. ICFO researchers Klaas-Jan Tielrooij, Lukasz Piatkowski, Mathieu Massicotte and Achim Woessner led by ICFO Prof. Frank Koppens and ICREA Prof. at ICFO Niek van Hulst, in collaboration with scientists from the research group led by Pablo Jarillo-Herrero at MIT and the research group led by Jeanie Lau at UC Riverside, have now demonstrated that a graphene-based photodetector converts absorbed light into an electrical voltage at an extremely high speed. The study, entitled "Generation of photovoltage in graphene on a femtosecond timescale through efficient carrier heating", has recently been published in Nature Nanotechnology ("Generation of photovoltage in graphene on a femtosecond timescale through efficient carrier heating"). The new device that the researchers developed is capable of converting light into electricity in less than 50 femtoseconds (a twentieth of a millionth of a millionth of a second). To do this, the researchers used a combination of ultrafast pulse-shaped laser excitation and highly sensitive electrical readout. As Klaas-Jan Tielrooij comments, "the experiment uniquely combined the ultrafast pulse shaping expertise obtained from single molecule ultrafast photonics with the expertise in graphene electronics. Facilitated by graphene's nonlinear photo-thermoelectric response, these elements enabled the observation of femtosecond photodetection response times." 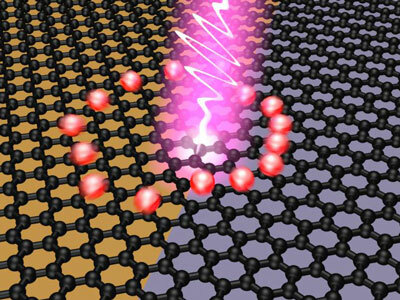 The ultrafast creation of a photovoltage in graphene is possible due to the extremely fast and efficient interaction between all conduction band carriers in graphene. This interaction leads to a rapid creation of an electron distribution with an elevated electron temperature. Thus, the energy absorbed from light is efficiently and rapidly converted into electron heat. Next, the electron heat is converted into a voltage at the interface of two graphene regions with different doping. This photo-thermoelectric effect turns out to occur almost instantaneously, thus enabling the ultrafast conversion of absorbed light into electrical signals. As Prof. van Hulst states, "it is amazing how graphene allows direct non-linear detecting of ultrafast femtosecond (fs) pulses". The results obtained from the findings of this work, which has been partially funded by the EC Graphene Flagship, open a new pathway towards ultra-fast optoelectronic conversion. As Prof. Koppens comments, "Graphene photodetectors keep showing fascinating performances addressing a wide range of applications".